In 2005, Karen Kurr began preparing, freezing, and selling her Cajun and Southern dishes at local farmers markets. 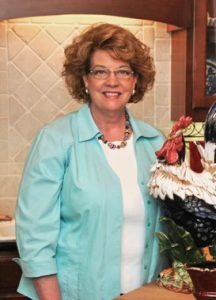 Today, you will find her frozen meals cooked from scratch in over 200 Kroger stores and independent retailers as well as her online store. Though initially launching the business from her family kitchen, Karen soon added a commercial kitchen to her home. As demand grew, she hired her friends to help and soon took over her daughter’s bedroom, her husband’s study, the family sun room, and garage. As her hobby became a business, Karen finally moved production out of her home and into a USDA food plant. As a certified Woman Owned Business, she qualified for low interest loans through the Mississippi Development Authority. From Karen’s Chicken Pie to her mama’s Chicken and Dressing, each No Time 2 Cook dish is cooked from scratch using whole food ingredients. Karen is passionate about food, entrepreneurship, and bringing families back to the dinner table. When Karen isn’t cooking, she is usually sharing her passion with others.